Even more concerning was that we had to discover that both birds showed a very poor plumage development with broken primary and secondary as well as damaged tail feathers. 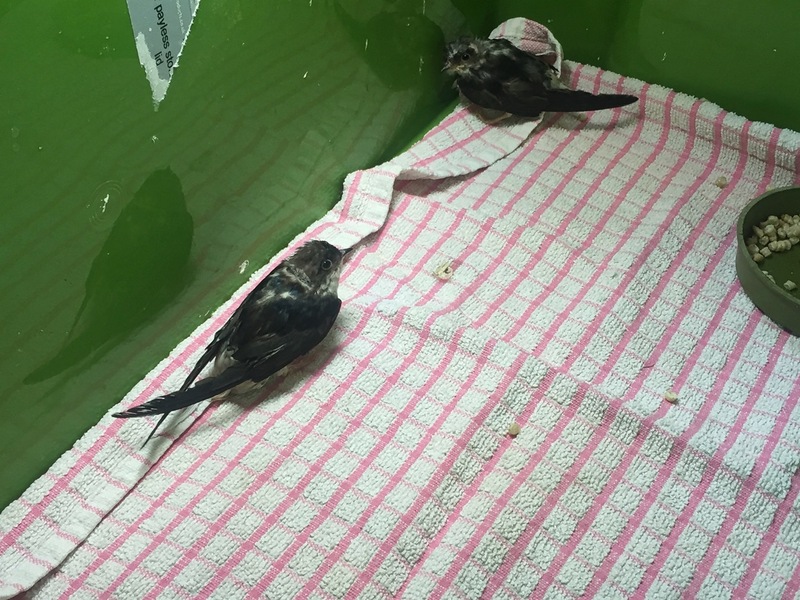 Both birds were in severe distress, whilst being assessed and every time they had to be handled. Narziss and Goldmund did not stop screaming for a long time after any closer contact, which is very unusual for house martin fledglings. 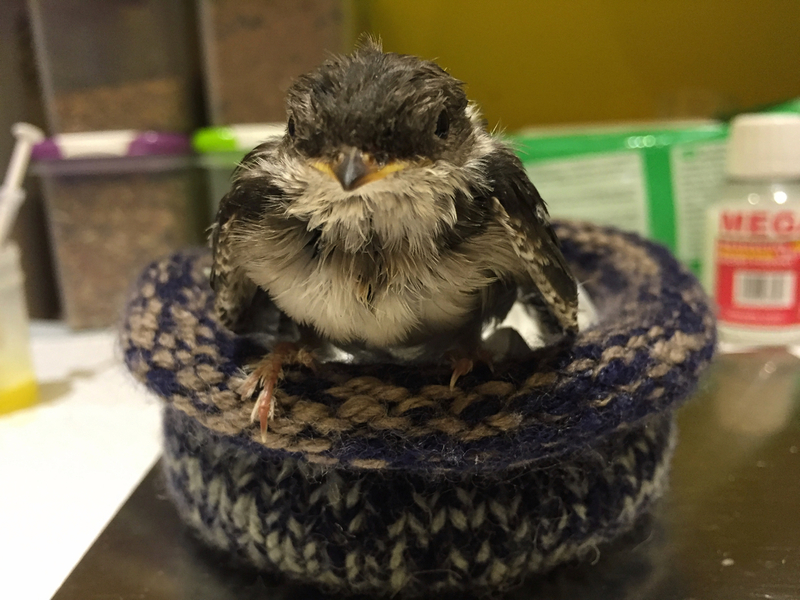 Although the background information we have been given sounded reasonably convincing, our findings and the observed behaviour are actually more in keeping with birds, who have been raised and prematurely released by an unexperienced carer. Most likely they have been raised on an insufficient and unsuitable diet lacking essential amino acids, vitamins and minerals. Also, the observed plumage damage pattern is indicative of birds being kept in a metal wire cage. All these above mentioned problems have lead to malnutrition, plumage damage and severe psychological problems. 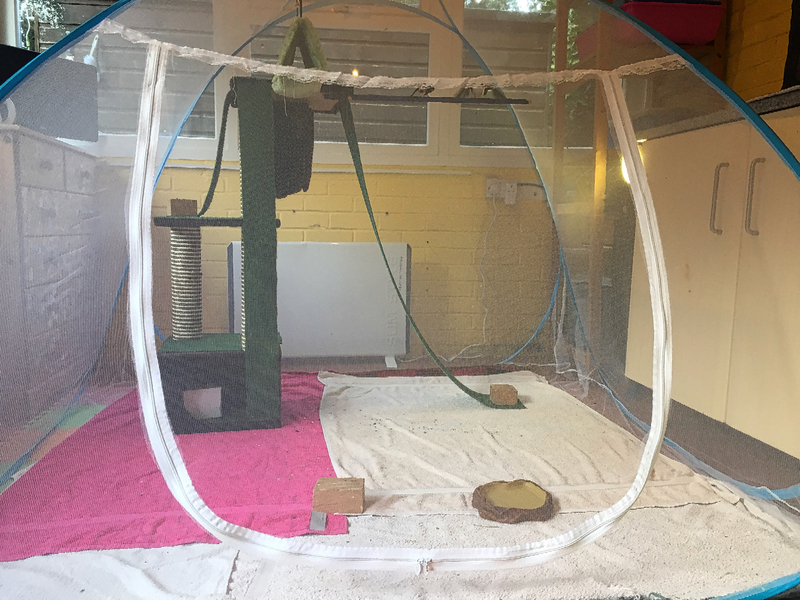 It took us several days to stabilise the acute health problems and also to persuade both birds to accept a balanced insect based diet. Despite their health problems, Narziss and Goldmund showed a very aggressive behaviour towards each other, which forced us to separate both birds temporarily. It is generally known that noisy good natured squabbling and jostling for favourite positions on perches and in the nest is a normal behavioural pattern for house martins. 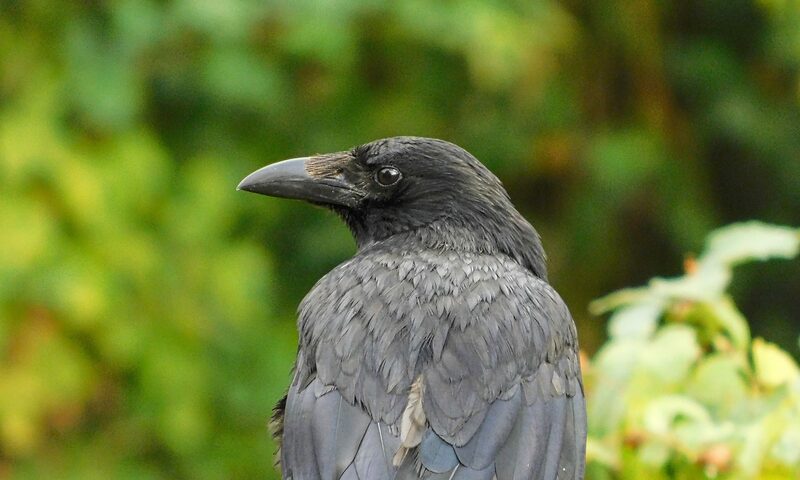 However, true aggression with serious fighting potentially leading to injuries is pathological and commonly a feature seen in birds with calcium and vitamin deficiencies. And in fact, after a treatment course with calcium and vitamin B complex both birds reverted back to a normal behaviour and could be eventually reunited again. 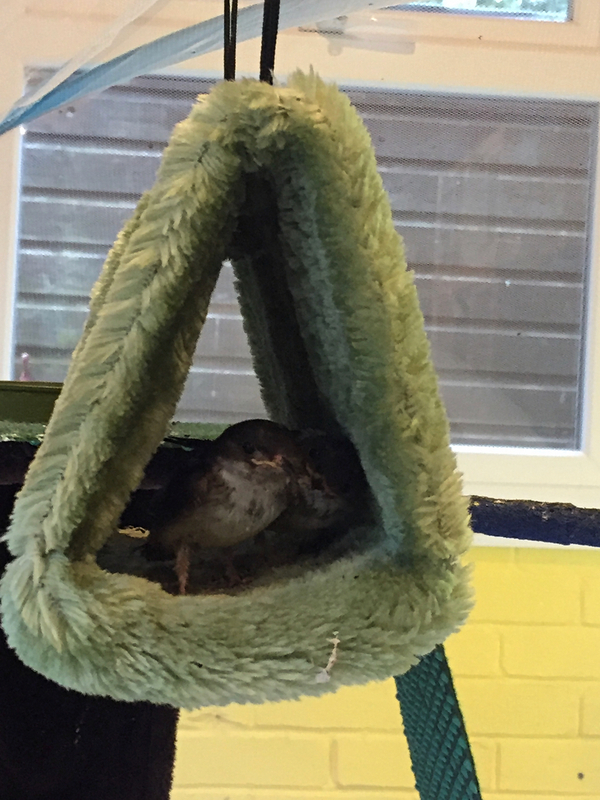 Although Narziss and Goldmund were on the brink to fledge, both birds preferred to stay in their artificial nest pan, which we put into a large flexarium, which is a soft fabric mesh indoor aviary. It took several days before both birds left the nest during the day to perch and to move around and to explore their aviary, which indicates that they must have left their nest or temporary home, for what reason ever, prematurely. Still, for quite a while both birds preferred to spent the night in their cosy nest. Over the next weeks both birds settled in very well and started to eat independently, the latter being an essential step in this specific situation and in their development, as both birds are not releasable this year and are in need to be overwintered. Today house martins Narziss and Goldmund moved in to their new winter quarters. Both birds will spend the next months in a safe and heated large indoor flight aviary, allowing them to engage in their daily activities and more importantly allowing them to exercise. Artificial UVA and UVB light sources will provide the necessary extended daylight hours and their diet will also be modified accordingly. The indoor environment has been adapted to their current special needs including their restricted flying capabilities and will be adjusted in accordance to their plumage development. Narziss and Goldmund settled in very well and are in particular enjoying their cosy hiding and roosting places. With a heavy heart we said goodbye today to our house martins Narziss and Goldmund, who went yesterday onto the first leg of their first migration journey to their future wintering grounds in Africa, exactly at the same time as their own kind and relatives are returning from Africa and are arriving back in Europe. Narziss and Goldmund stayed with us over the winter for more than eight months, after they have been admitted as fledglings with severely damaged and insufficient plumage, which has rendered them flightless and was very likely caused by a nutritional deficiency due to being raised on an insufficient and unsuitable diet. Over the last few month both birds have started to moult, but both birds need far more time until they will regain their normal plumage. Narziss and Goldmund have enjoyed their 1000 km car journey and arrived safely at their new temporary home. 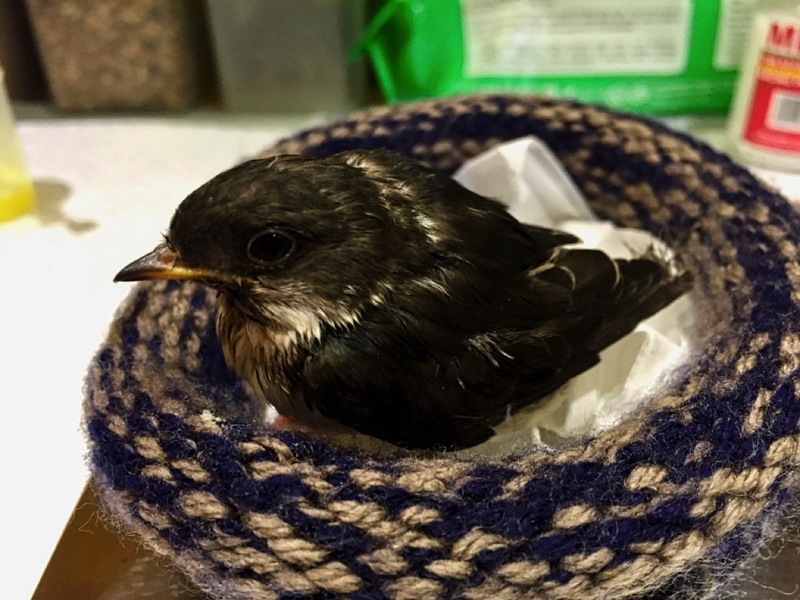 A good friend and experienced fellow rehabber specialising in long-term care and rehabilitation of martins, swallows and swifts, will kindly take over their future care. 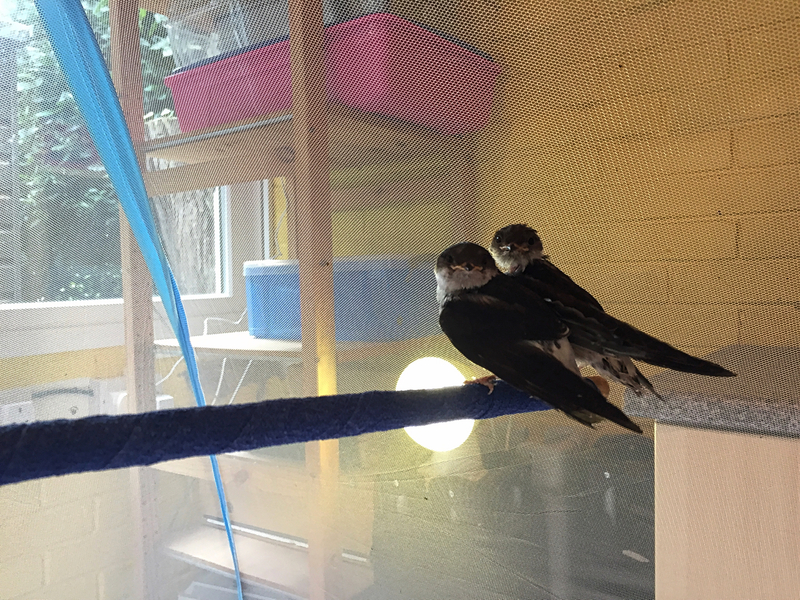 Narziss and Goldmund will join a larger group of martins and swallows, which will provide them with more enjoyable company and will also increase their chances of a successful release. Take care Narziss and Goldmund! We will miss you!